Executed in 1954. This work is from an edition of twelve. D. Chevalier, "Un grand sculpteur: Germaine Richier, Prestige francias et Mondanites, Paris, 1956, pp. 60-65, no. 19. A. Chastel, "Germaine Richier: la puissance et le malaise," Le Monde, 13 October, 1956. S. Tenand, "De Germaine Richier a Leonard de Vinci," Tribune des antions, Paris, 16 October 1956. D. Chevalier, "Dans son atelier, vaste foret de platres et de bronzes, Germaine Richier, chef d'ecole, sculpte les grands mythes sylvestres," Femme, Paris, October-November 1956, pp. 81-83. G. Limbour, "Le pouce de Germaine Richier," France Observateur, November 1, 1956 (another example illustrated). Y. Taillandier, "Germaine Richier," Connaissance des arts, July 1958, no. 77, pp. 24-29. J. Cassou, Sculpteurs Modernes: Richier, Paris, 1961. Brassai, Germaine Richier: Les Artistes de ma vie, Paris, 1982, pp. 194-197. 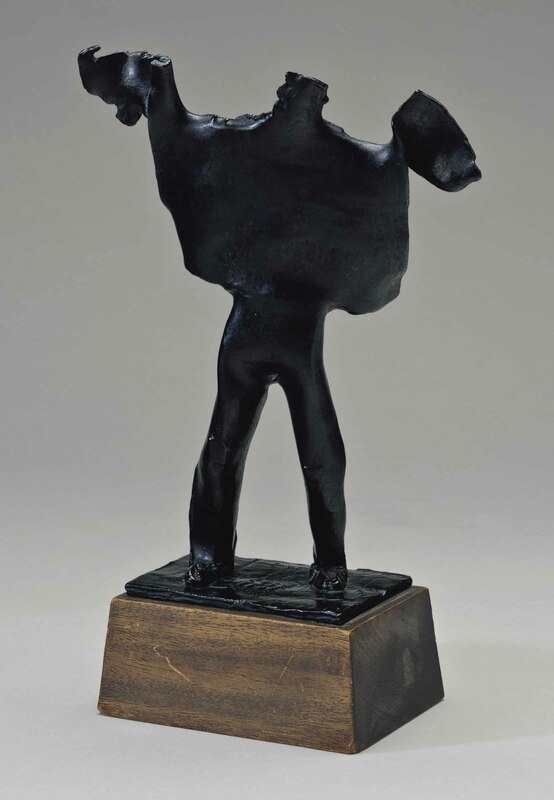 London, The Hanover Gallery, Germaine Richier, October-November 1955, no. 22-43 (another example exhibited). Minneapolis, Walker Art Center, Richier, September-November 1958. Bonston University School of Fine and Applied Arts, Richier, January-February 1959 (another example exhibited). Arles, Muse Rattu, Germaine Richier, no. 43-45 (another example exhibited). The Arts Club of Chicago, Richier, January-February 1966 (another example exhibited). London, Hanover Gallery, Contrasts, July-August 1967, no. 53 (another example exhibited and illustrated). London, Gimpel Fils Gallery, Sculptures and Reliefs, June-August 1969, no. 38 (another example exhibited and illustrated). Kunsthaus Zurich, Der Skupturensaal Werner Br im Kunsthaus Zurich, no. 23 (another example exhibited and illustrated). Humlebaek, Louisiana Museum of Modern Art, Germaine Richier, August-September 1988, no. 28 (another example exhibited and illustrated). Saint-Paul-de-Vence, Fondation Maeght, Germaine Richier Rétrospective, April-September 1996, p. 207, no. 66 (another edition exhibited and illustrated in color). Berlin, Akademie der Knst, Germaine Richier, September-November 1997, no. 69 (another example exhibited and illustrated). Franoise Guiter will include this work in the upcoming Germaine Richier Catalogue Raisonné in preparation and we are grateful for her assistance.